On October 27, US Defense Secretary Ashton Carter announced that the Pentagon is contemplating “direct action on the ground” in both Iraq and Syria, “in an effort to combat the self-proclaimed Islamic State terrorist group.” (Sputnik, October 27, 2015). The not so hidden agenda, however, is not “to combat” but rather “to protect and come to the rescue” of the Islamic State terrorist group. What’s new? Are we witnessing a process of military escalation? The US and its allies already have boots on ground inside Syria. It’s not official, it’s a so-called “covert operation” which everybody knows about. The Pentagon together with NATO, Turkey and Israel, et al, have routinely dispatched their military advisers, special forces and intelligence operatives to the Syrian war theater. These foreign forces have operated within rebel ranks from the outset of the war on Syria in March 2011. While neither Washington nor the mainstream media have “officially” acknowledged their presence inside Syria, it should be understood that these Western special forces have performed routine command functions within the various terrorist groups in liaison with the US-NATO led coalition. In other words, they are largely responsible for coordinating countless ISIS and Al Nusrah terrorist operations against civilians inside Syria on behalf of the US led coalition. Needless to say, they are also supported by the US led air campaign, which theoretically is targeting (rather than “protecting”) the terrorists. In response to Russia’s bombing raids against ISIS, Washington is now contemplating to announce “officially” (what they have been doing for the last four years) their resolve to have boots on the ground in an extended military operation. Needless to say, this operation, if it were to be carried out without the UN Security Council stamp of approval would constitute a violation of international law (Nuremberg). The US administration is considering the possibility of deploying a small number of ground forces in Syria embedded among Kurdish troops or the “moderate” opposition, The Wall Street Journal reported Wednesday, citing US officials. The US military has also proposed sending a group of combat advisers to the front lines with the Iraqi army, and possibly also with Syrian rebels. This proposal is, nevertheless, qualified by the newspaper as a less likely scenario. Another important development pertains to the statement by Defense Secretary Ashton Carter that while “a no fly zone” is not contemplated in the immediate future by the Pentagon, it nonetheless remains an option: “President Barack Obama has not taken the option of a Syrian no-fly zone ‘off the table'”. From the outset, Qatar has acted as a US proxy. 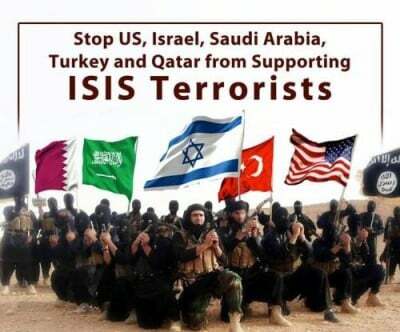 Together with Saudi Arabia it has contributed to the recruitment, training and financing of Al Qaeda affiliated terrorists inside Syria including ISIS and Al Nusrah. These various actions and threats by the US led coalition –not to mention the chatter pertaining to a “World War III option” in the corridors of the US Congress– point to a scenario of military escalation, which could potentially lead to direct military confrontation between the US led coalition and the Russian Federation.